Please note that the 66 Street Planning Study is not related to the work being done on the Southeast Valley LRT line. LRT inquiries should be directed to 780-496-4874 or email LRTProjects@edmonton.ca. City staff conducted a concept planning study for 66 Street from Ellerslie Road SW to 23 Avenue NW to determine the improvements needed to this 2-lane, partially urbanized roadway. Review the recommended concept plans. 66 Street serves as an important commuter route connecting residential areas in the City’s south side to Whitemud Drive and downtown Edmonton. 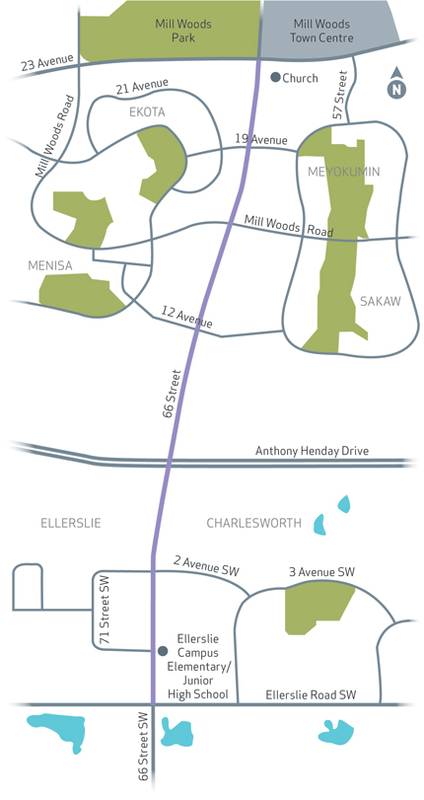 North of Whitemud Drive, 66 Street becomes 75 Street, a major commuter and goods movement corridor, and an integral part of the City’s inner ring road. New residential neighbourhoods planned for south of Anthony Henday Drive are driving a need to reassess the roads serving those areas. Interviews with impacted stakeholders were conducted in February 2014 and the recommended concept plan was completed in spring 2014. To date, no funding has been allocated for the widening of 66 Street along the study corridor and construction timelines are unknown. 66 Street recommended concept plans are now available for review. This document is a summary of "What We Heard" from residents and business through our public involvement process and how those comments are addressed in the recommended concept plan. 66 Street draft concept plans are now available for review. If you have questions or comments about the project, please direct them to the contact listed below.